So many Batmans running around. So boring! Honestly, why would you want to be such a dark brooding person anyway? Talk about sad! You know what Bats could use? A laugh or two. Lucky for Batman, we know just the fella. He's got a great sense of humor and can make just about anyone laugh. We're talking the clown prince of crime himself, of course: the Joker. 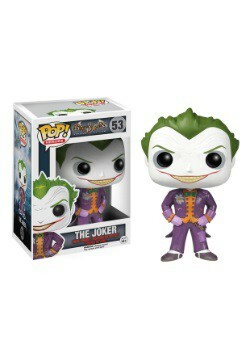 Ah, the Joker. Classic villain! 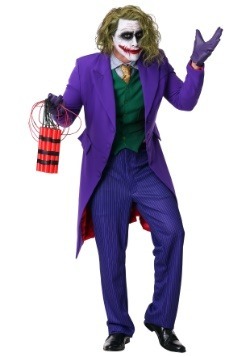 He's psychotic, chaotic, dramatic, and has a penchant for colorful crimes. He's got toys that go boom, and some that make you giggle. He's got a laugh that's contagious (not even counting the laughing gas), a killer girlfriend, and a flair for showbiz. Now doesn't that sound fun? Much better than some angry orphan boy who never cracks a smile, eh? You know we're right. The Joker is known for his bright green hair and purple clothes, but of course there are quite the few variations on his look. 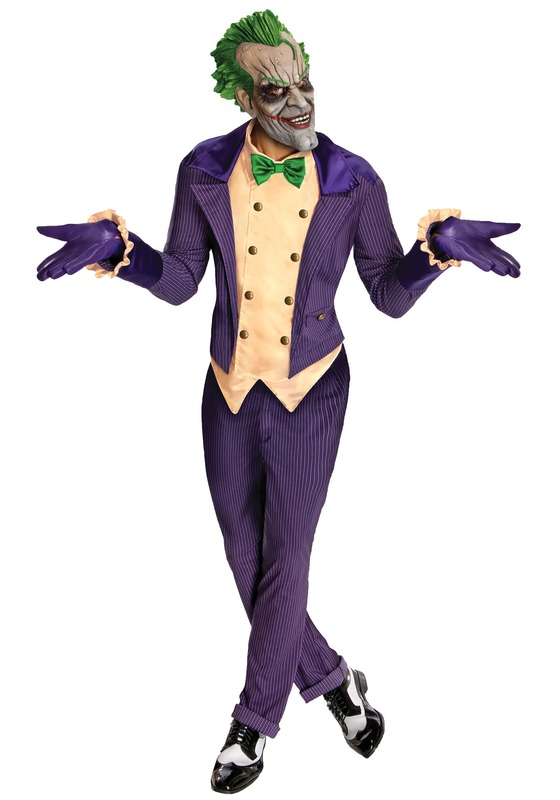 One of our favorites is this Arkham City The Joker Costume. 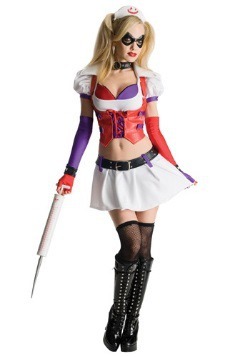 From the well-know Batman video game franchise made by Rocksteady Studios, this costume delivers on delight. 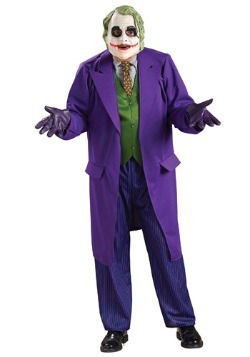 It has purple pinstriped pants, a purple tailed pinstripe coat (with yellow vest panel), gold buttons, yellow ruffled cuffs, purple gloves, and a molded latex mask to look like the clown of Gotham. This outfit is licensed, so you know it got all the details right. Now, just get yourself couple pairs of chattering teeth, and a flower that squirts water, and you'll be good to crack a joke and run a crime spree! See? Much more interesting than drab old Bat-sy over there.